025a – Who Framed Roger Rabbit (Part One) | All Eighties Movies. All The Time! 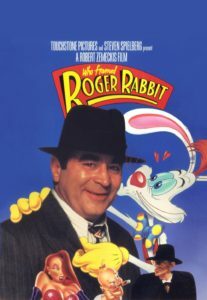 This entry was posted in Podcasts and tagged animation, comedy, roger rabbit. Bookmark the permalink. I loved this move so much. Thanks for recapping it for me plus including the making of which I’ve never seen. I’ll be showing this movie to my kids now they are seven and eleven. I think that is a suitable age. Plus they adore watching all the old animation cartoons. I had honestly forgot about this movie so thank you. I ADORE this movie. I’m with you Gidg. Love this over Raiders too. Had no idea Kathleen Turner was the voice of Jessica Rabbit. I feel silly now. But fantastic pod cast and going to listen to both today.